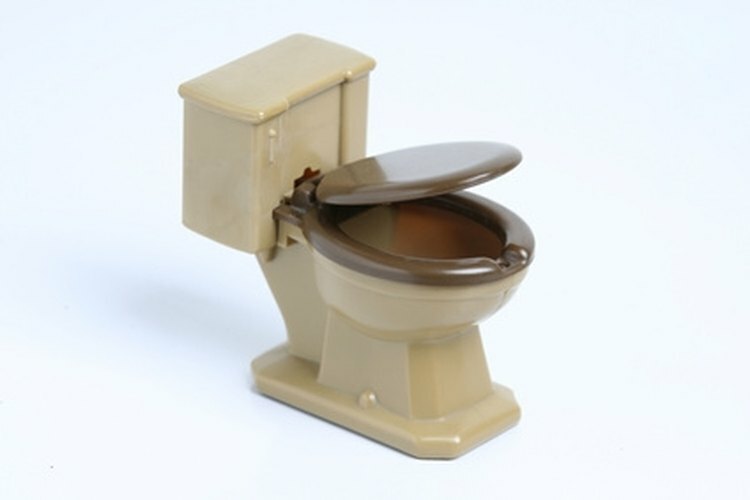 If your travel trailer doesn't travel, upgrade it with a household toilet. The toilets in travel trailers are usually relatively small. This is to conserve space and to limit the use of water since they drain into a holding tank instead of into a sewer. If you have your travel trailer permanently parked, have access to a sewer and have the room inside the trailer for a full-sized commode, there's no reason not to upgrade to a household sized toilet for comfort and increased flushing efficiency. Choose the location for the new toilet then measure carefully where it will sit on the floor of the trailer. Crawl under the trailer and use the measurements from step one to locate where the position of the toilet will be on the underside to see if there are any obstructions. If the new toilet will be replacing the original in the same general location, chances are the black-water holding tank will need to be removed. You can do this by removing the tank support straps and disconnecting the tank from the toilet by loosening the hose clamps at the top of the tank. Move any wires or other obstructions you find to ensure there's a 10-inch circular area free of all obstructions where the toilet discharge will come through the floor. Measure the location for the toilet discharge flange to be positioned. A common distance is 12 inches from the wall against which the toilet will set to the center of the flange hole. Your new toilet will indicate the proper rough-in dimension. Mark the spot where you want the center of the hole. Set the toilet flange on the floor, centering it on the mark made in the step above. Scribe a mark around the exterior of the flange which you'll use as a guide to cutting the hole in the floor. If you are lucky, the hole for the old toilet will be entirely inside the hole for the new one. Otherwise, you'll need to patch the old hole. Use a saber saw to cut the hole in the floor. Attach a toilet shut off valve in a relatively convenient location on the wall a few inches above the floor. Shut off the water to the trailer if it's connected to a water supply. Tap into an existing water line and plumb to the toilet shut off valve. If you are putting the new toilet where the old one sat, there will already be a flexible water supply line close by which can be fitted to the toilet shut-off valve. Make any repairs to the sub-floor and/or flooring before installing the toilet. Run a bead of silicone caulk around the upper edge of the hole you cut in the floor. Position the toilet flange into the hole with the notches for the toilet bolts parallel with the wall behind the toilet. Push firmly into the silicone, then drill through the holes on the flange through the hole and insert a 1/4-inch stainless steel flat-head bolt in each hole. Crawl under the trailer and put a stainless steel washer and nut on each bolt then tighten to firmly attach the flange to the trailer floor. Insert a toilet flange bolt into the slots on each side of the flange. Set a wax ring into position on the toilet flange. Lower the toilet onto the wax ring and apply your full weight to squish the toilet onto the wax ring. Tighten the nuts onto the toilet flange bolts to lock the toilet to the flange. Connect the toilet tank to the toilet shut-off valve with a flexible toilet supply line. The above steps complete the toilet installation. There are a number of options available to connect the toilet flange now protruding from through the floor on the underside of the trailer to the sewer. Choose the method which best suits your situation or the regulations of the trailer park if you are in a controlled facility.